Rosacea Care is proud to offer to the world of rosacea the extraordinary benefits of ZinClear™, the most advanced form of Zinc Oxide. 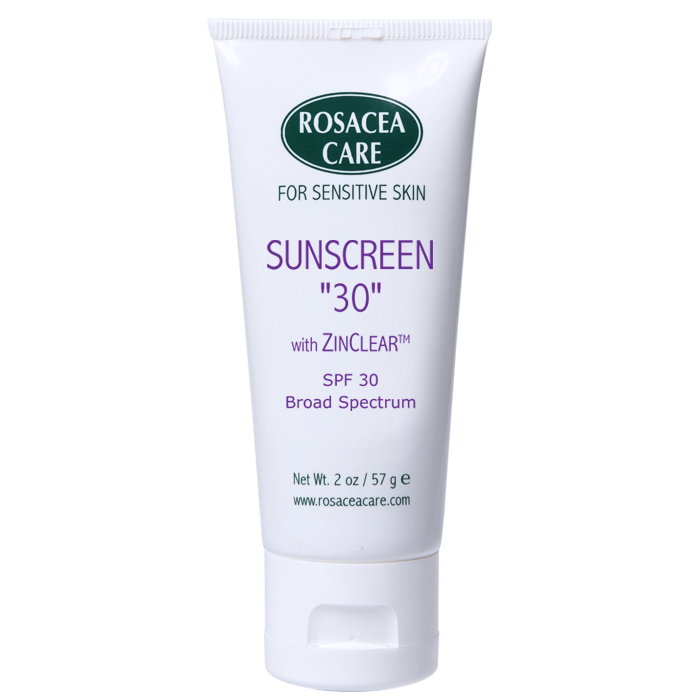 Our physical Sunscreen "30" uses the power of Zinc Oxide, which provides broad spectrum protection from UVA and UVB exposure and also helps in calming irritated skin. The powerful improvements to Sunscreen "30" formula include antioxidants to protect against free radical damage and keep your skin glowing with health. The elegant formula with vitamins and herbal extracts such as Kukui Seed oil is also a perfect moisturizer which hydrates and soothes the skin as it leaves a translucent finish. Contains 13.5% of ZinClear™, the most advanced form of Zinc Oxide, which provides broad spectrum protection from UVA and UVB exposure and also helps in calming irritated skin. Spending time in the sun increases your risk of skin cancer and early skin aging. To decrease this risk, regularly use a sunscreen with a broad spectrum SPF of 15 or higher and other sun protection measures including: Limit time in the sun, especially from 10am-2pm. Wear long-sleeve shirts, pants, hats and sunglasses.